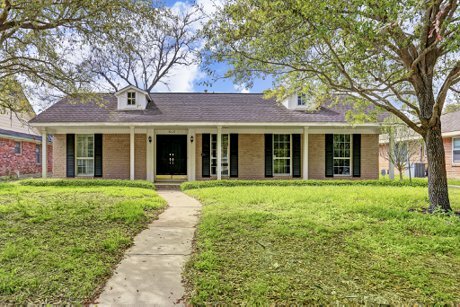 4119 Cason Street | FOR SALE in West University Place, TX! 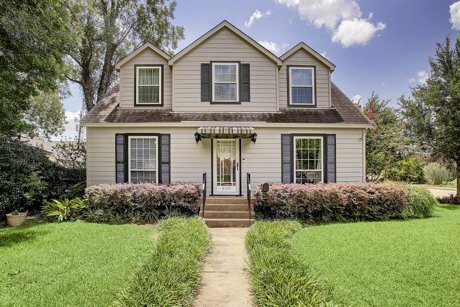 4119 Cason Street is a charming four bedroom, three full bathroom colonial-style home located in the heart of West University Place. This home has elegant formal livings, all hardwood floors on the first floor, bedrooms located on the first floor as well as the second, a fully enclosed sun room overlooking the backyard and more! Convenient location in the heart of West University Place. Easy access to the Medical Center. Located on a corner lot. Hardwood floors on first floor. Elegant formal living and dining rooms. Working kitchen with a garden window. Two secondary bedrooms located on the first floor, both with Murphy beds. Full bathroom downstairs. Spacious upstairs master bedroom with study nook and built-in shelves. Master bath has granite counters and shower. Fourth bedroom upstairs has its own full bath as well. Fully enclosed sun room with air conditioning overlooks the backyard. Sprawling backyard with walkway leading to two car detached garage. 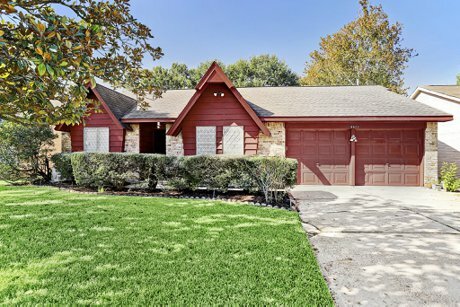 4120 Ruskin Street | SOLD in West University Place, TX! 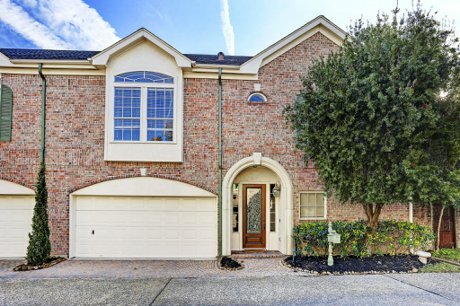 4120 Ruskin Street is a two story stucco home located in West University Place, TX. This five bedroom, four and a half bath home, located on a corner lot, features great natural lighting, an open floor plan, lush landscaping, fresh paint, new carpets, high ceilings, and more! The backyard has a fantastic social area, including a summer kitchen and covered patio. Located on a corner lot on a shady, tree-lined street. Plentiful windows for natural lighting. New appliances. High ceilings, fresh paint, new carpet, recessed lighting, hardwood floors, crown-moldings, built-in speakers and plantation blinds throughout the house. Two new air conditioning units. Two car garage reached from side street, not Ruskin itself. Front entry with spiral staircase to second floor. Stairway windows have remote controlled exterior shades. French doors lead to the study. Dining room and a powder room located off of the entry. Formal dining room with tray ceiling, chair rails, wainscotting, and a crystal chandelier. Living room with gaslog fireplace with a marble fireplace surround and a large fireplace. Big screen TV remains with the house. Rolling 'library ladder' provides easy access to upper built-in shelves. French doors lead to the back patio. Island kitchen and breakfast area are floored in ceramic tile. Rear stairwell leads to upstairs landing near master bedroom. Plentiful storage. Island is topped with butcher block, other counters are granite. Stainless steel double ovens. Microwave, side-by-side refrigerator. Wrought-iron pot rack. Butler's pantry with glass-front shelves, granite counter, and storage pantry located between the kitchen and dining room. Full bathroom located next to laundry room and garage. Luxurious master bedroom suite with marble surround gaslog fireplace. French doors lead to an enclosed sunroom with tile floors, sliding windows, and a television which remains with the house. Master bathroom with skylight, inlaid tile floors, double vanities, and double sinks; Extra-large shower with two shower heads, hand shower, and glass surround; Jet tub, separate water closet, and two walk-in closets. Four secondary bedrooms up, all with fresh carpet, good natural lighting, high ceilings, and large closets. Two secondary bathrooms serve the secondary bedrooms. Outdoor entertainment area reached from the living room. Covered patio is paved with weathered herringbone brick. Waterfall located near the seating area. Full summer kitchen with stainless steel appliances, quartz countertops, stone floors, garbage disposal, counter refrigerator, separate water heater, trash compactor, double-sink, four burner gas stove, BBQ grill and a griddle. Dine-in counter off of summer kitchen as well. 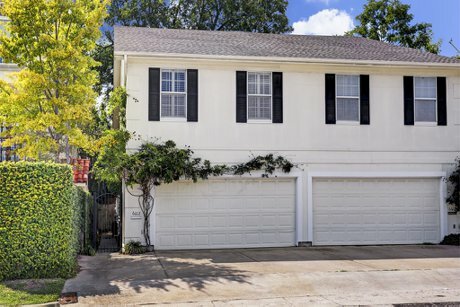 2214 Naomi Street | SOLD near Texas Medical Center! 2214 Naomi Street is a three bedroom, two full bathroom single family patio home located in the gated community of Naomi Place. This lovely home features an open floor plan with a combined living and dining area on the first floor open to the kitchen, fresh paint, new stainless steel appliances, a generous wrap-around backyard and more! Single car garage with fully fenced backyard and additional parking space. Open great room off of the entry, with the combined living and dining space open to the kitchen. Sliding glass doors off of kitchen lead to backyard. Updated kitchen with new stainless steel appliances and tile floors. Breakfast bar seating, plentiful storage, and a stainless steel double sink. Master bedroom with gambrel ceiling, tile floors, and plentiful natural light. Master bathroom has double-sinks, a glass brick privacy window, and a combo tub/shower. Two secondary bedrooms, both with tile floors, plantation shutters, good sized closets, and great natural lighting. Secondary bedrooms served by a secondary hall bathroom with another tub/shower. Home is built in Naomi Place, a gated community with secure coded access. Great location near the Texas Medical Center and NRG Stadium. 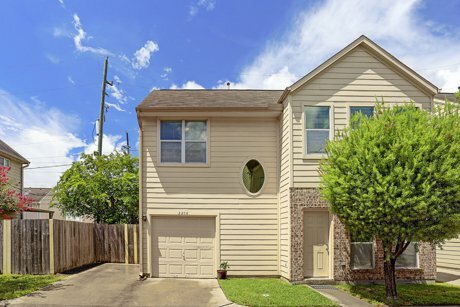 Just blocks away from the Metro train station at Naomi and Fannin Street, making for an easy commute to Downtown Houston or the Medical Center. Zoned to Whidby Elementary School, Cullen Middle School, and Lamar High School. Please check availability. >More Rice/Museum District Homes For Sale! 5611 Innsbruck Street | LEASED in Bellaire, TX! 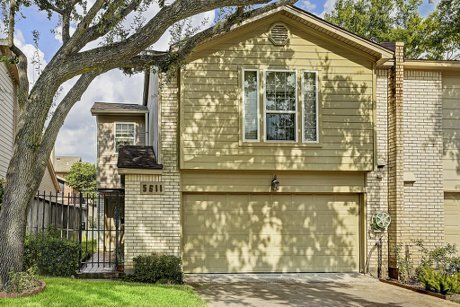 5611 Innsbruck Street is a beautiful townhome in Bellaire, TX. This super-rental is part of a ninety-nine townhome community. Extra wide lot, only attached to one other unit, only three units away from the complex swimming pool and picnic area. Very open floorplan with slick updates and first floor living. A must see property. Part of a 99 townhome community with retention walls. Extra wide front walkway and patio. Open floorplan with first floor living. Living room with vaulted ceiling, wood-burning fireplace, tons of windows for natural light, and tile floors styled to look like hardwoods. French doors overlooking back patio. Spacious dining room open to kitchen and living room. Kitchen with ceramic cooktop, convection oven/microwave, and stainless steel appliances. Slick modern flair. Large master bedroom and secondary bedrooms upstairs, plush carpet. Back patio wraps around the unit to the front entry gate. Great location. Just three units away from the complex pool and picnic area. Zoned to Horn Elementary, Pershing Middle School, and Bellaire High School. 6723 Westchester Court | LEASED in West University Place, TX! 6723 Westchester Court is an elegant two story townhouse located on a private street between Westchester and Sewanee. This three bedroom, two and a half bath home has a an open first floor with combination living and dining area, an island kitchen with granite counters, downstairs hardwoods, an upstairs gameroom with built-ins and more! Entry hall with leaded glass front door. Open first floor floorplan with combined living and dining area. Hardwood floors down, carpet up. Crown moldings, neutral wall colors, and high ceilings. First floor study could be used as a bedroom. Family room with built-ins and a gaslog fireplace. Island kitchen with granite counters, breakfast bar seating, white cupboards and appliances, and gas cooktop. Refrigerator remains with property. Upstairs gameroom with built-in storage and space for a television. Master bedroom suite with tray ceiling, recessed lights, and crown moldings. Space for a king-sized bed. Master bath with whirlpool tub, separate shower, double-sinks and walk-in closet. Two secondary bedrooms upstairs with good natural lighting and closet space. Zoned to West University Place Elementary, Pershing Middle School, and Lamar High School. Please check availability. 6519 Mercer Street | LEASED in West University Place, TX! 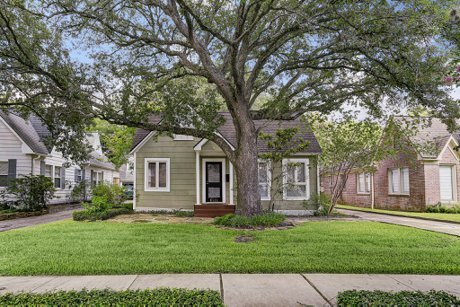 6519 Mercer Street is a cozy 2 or 3 bedroom cottage built on a large 7,500 square foot lot. This comfortable home has an open floorplan, master bedroom down with its own sitting area, and a flexible upstairs landing that could serve a number of purposes! Hardwood flooring, neutral paint, crown moldings. Large living room with under stair storage cubby. Dining room with large window for natural light surrounded by shelving. Spacious kitchen with Maytag dishwasher and Jenn-Air 4-burner electric stovetop & single oven. Large counters, plentiful drawers and storage space. Large pantry. Family room open to kitchen with wall of cupboards for storage. Utility/Mud Room located at back of kitchen opens to backyard deck. First floor master bedroom with closet, sitting area. Sitting area could serve as a nursery or office space as well. First floor hallway bath with walk-in shower. Cozy upstairs game room. Full bath with tub. Walk-in closet. Upstairs living space is flexible, could also serve as office space or a third bedroom. Lovely backyard deck with mature landscaping. Long driveway. Carport has an outdoor storage or work area. Potting room attached to back of carport. 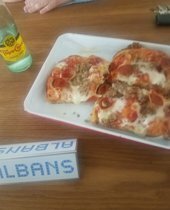 Great location in the heart of West University Place.